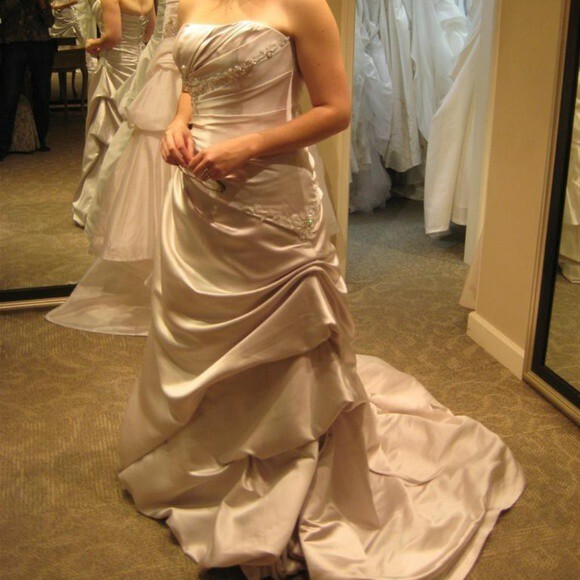 An unaltered, oyster-colored strapless dress with a moderate train, worn once and professionally cleaned. The only changes to the original dress were the addition of a bustle. I'm a long-legged 5'7" and wore heels about 2.75" tall, and the dress hit the floor perfectly. Corset back, asymmetrical beading on the bodice, and lots of ruching. The oyster color is a nice warm silver. I'm happily married and would love for this dress to have a second life. Feel free to ask for more details or more photos! There's two sections where the hem came apart (we left it unbustled too long! ), but the fabric is totally fine. I am happy to re-attach it and make it good as new if you're certain you won't need length alterations. French bustle added - that's it!